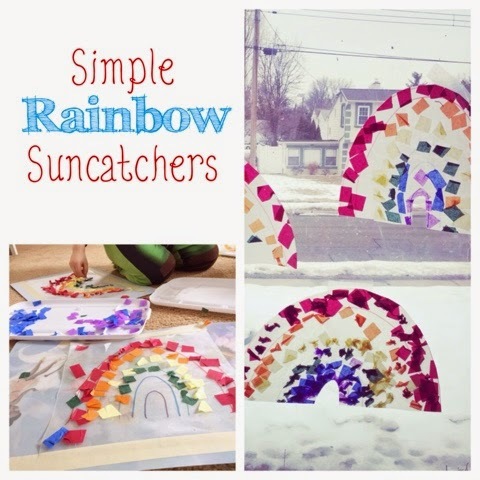 This simple rainbow suncatcher craft turned out beautifully and is great for a variety of ages, you will really be able to see the difference in ability with age but no matter how ‘accurate’ these are they will come out beautiful! 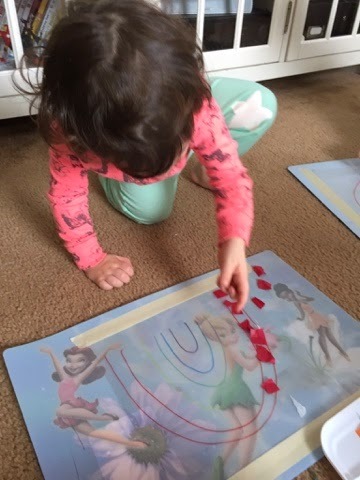 I started by using placemats with a piece of contact paper taped to it (sticky side up), you can also just tape the contact paper to a table but the kids wanted to do them on the floor. I drew a quick template on the paper, but you could forgo this step for older children. I then cut small squares of tissue paper up and placed them on trays. 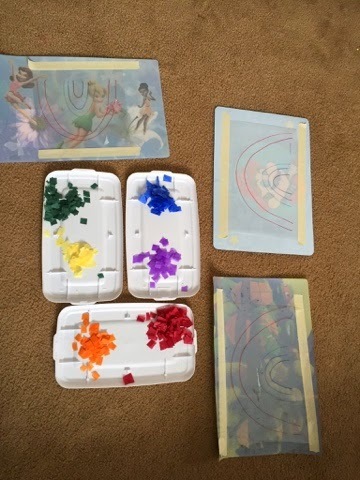 When doing the activity, I only presented 2 colors at a time to the kids so that it was easier to follow along with the color order of the rainbow. The younger children were able to complete some of this independently, yet they needed me to give them one color at a time, and show them which row to place the squares on. This is great fine motor for little hands and the big sticky mat makes it incredibly manageable (and fun!) for kids. My older one was able to complete this independently with the template drawn on the paper. 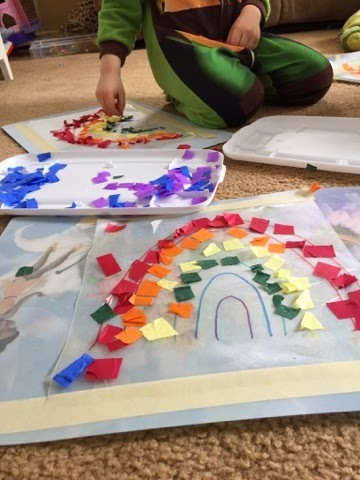 He knows the color order of the rainbow and sang his rainbow color song almost the entire time he worked on the project. 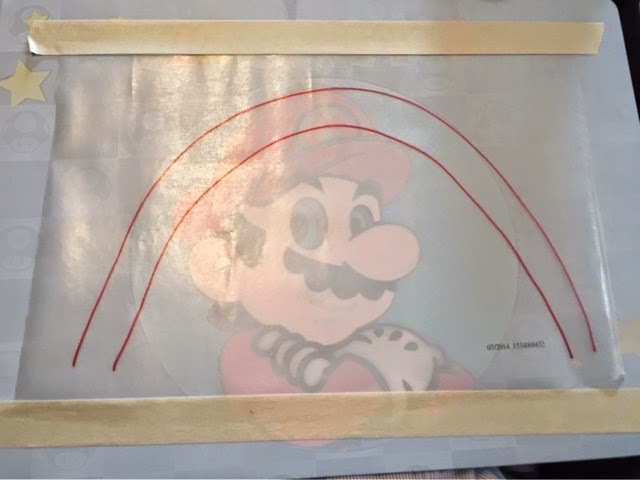 Once the rainbow is complete, take another piece of contact paper and place it, sticky side down, on top of the rainbow. This should sandwich the tissue paper between the contact paper. 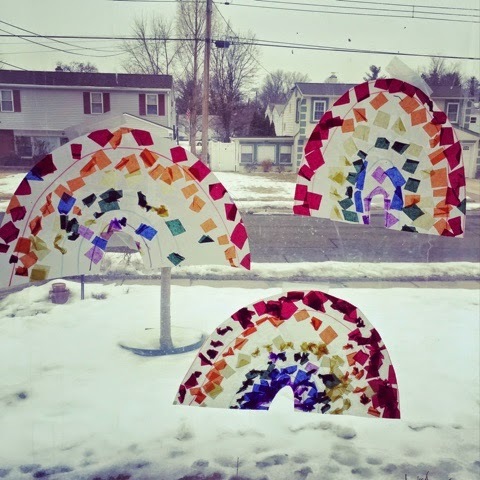 Next, we cut the paper into a rainbow shape. 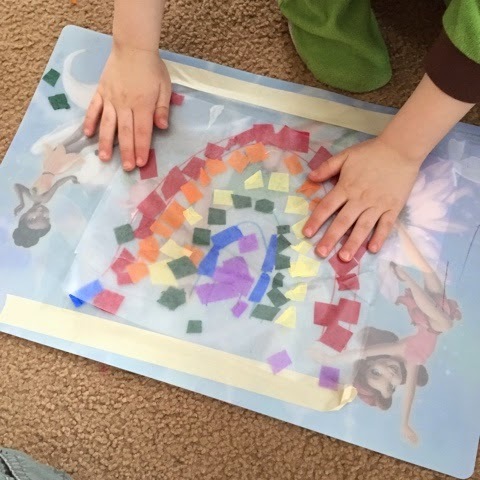 If your toddler has just thrown the colored paper down and hasn’t followed the order of the rainbow, trust me when you cut it out to shape it will still be beautiful!